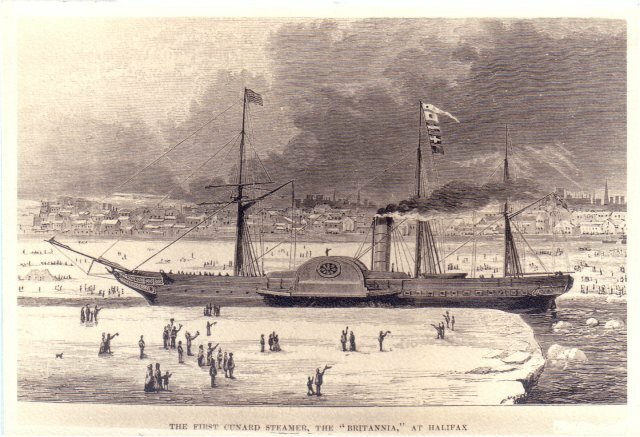 Picture postcard of the first Cunard Steamer, the 'Britannia', at Halifax, Nova Scotia. Cunard also established a branch line from Halifax via Bermuda to St. Thomas in the West Indies as well as one between New York and Havana, Cuba, via Nassau in the Bahamas. The former service, under contract to the British Admiralty, ended the Falmouth to Halifax packet service. For details of this service see The Bermuda Packet Mails and the Halifax-Bermuda Mail Service 1806 to 1886, by JC Arnell and MH Ludington, The Postal History Society.